Satisfaction with the way violent crime, antisocial behaviour and vandalism are dealt with in the Capital has crashed to a six-year low following the introduction of Police Scotland, according to a major council survey. Just half of residents now say they are happy at the way antisocial behaviour is managed compared with 2009 when the Edinburgh People Survey began, with approval ratings falling by between 19 and 21 per cent across a range of public safety issues. The figures, compiled following the first full year of Police Scotland, raise questions about the level of confidence in local policing in the wake of concerns over changes to housebreaking investigations, the closure of police counters and a surge in theft and violence in the north of the Capital. Edinburgh West Liberal Democrat MP and former policeman Mike Crockart said senior officers needed to focus more on local concerns. He said: “These are a worrying set of statistics for Police Scotland with significant falls in satisfaction across a wide range of issues. It’s not a great surprise following the series of controversies about policies around housebreaking, station public counter closures, stop-and-search and the increased use of armed officers. North Edinburgh has been hit by a spate of violent crime, fireraising and motorbike thefts, with joyriders blighting the community, and just one in five residents say they are satisfied with crime management. The rock-bottom ratings for tackling crime come despite the high-profile Strong North campaign championed by the council, Police Scotland and community leaders. But community safety leader Cammy Day said the Stronger North approach of working in partnership was delivering results and would be rolled out to other areas through a new agreement on city policing being negotiated with Police Scotland that would target 44 council-funded local officers on community concerns. Tenants and Residents in Muirhouse chairman Robert Pearson said he was not surprised at the survey results, but welcomed the impact Stronger North was having. He said: “The amount of crime has been absolutely ridiculous. When the survey was carried out, the council were probably seen to be doing nothing to try and combat these issues. Chief Superintendant Mark Williams insisted crime figures were down, but said officers were consulting with residents on their priorities for policing. The police commander of the Edinburgh City Division said: “It’s great to see that 88 per cent of residents are happy with their community and 83 per cent feel safe after dark. “Edinburgh was recently voted the third safest city in the world to visit and this is backed up by clear evidence – violent crime is down 16 per cent over the last two years and over 25 per cent over the last five years. Robbery is down by 22 per cent over the last two years alone and our approach to domestic violence and sexual crime has seen detection rates rocket. 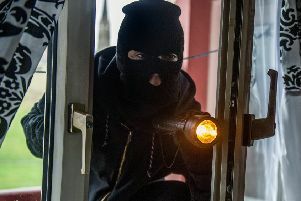 RADIO star Grant Stott says a horror break-in at his parents’ home was a shocking insight into the scale of Edinburgh’s housebreaking nightmare – and urged homeowners to secure their property. The Forth 1 host was left reeling a fortnight ago when his parents’ home was ransacked by thieves, who callously killed their pet goldfish by pouring vodka into their tank. The incident left Lexia and Leslie Stott, both 75, shaken and upset – and the DJ and former police officer said he had been overwhelmed by the number of people who had been in touch with him to talk of similar experiences. “I get the impression that housebreaking in Edinburgh is rife,” said Stott. “The impact it has on people’s lives is huge. “It’s not just stealing things, it’s the sheer devilment of destroying property. There’s only so much that the police can do. They can’t be everywhere, all-seeing eyes all the time.